« Cocoa and Carols and Excellence! How did that first Advent week go with your children? Did you ask them the questions I suggested to see what their framework for Christmas looks like? I’m very interested in their answers. Please share them with us all. Use the “Comments” section to tell us what your child/children said. For the second Advent week, we want to focus on the angel telling Mary that she is going to have a baby and on the story of the three wise men. Big Idea: Nine months before Christmas Day, God told Mary she was going to have a baby boy. Jesus was born like every other baby—fully human—but the Son of God. You have to read the story to your children, but read it from The Message or a Children’s Bible—but not a story book. Then use these conversation starters to talk about it at the appropriately level with your child. Why do you think God chose Mary to be the mother of Jesus? Who was going to be the father? (You don’t have to get into sexual questions here—unless you need to—but it is important for kids to learn that God is the Father of Jesus, not Joseph. Why do you think Mary was a little afraid of the angel Gabriel? Would you be afraid? How do you think Mary felt when she found out she was going to be the mother of Jesus? How long was she going to be pregnant? Do you think she could talk to people about what had happened to her? You might visit with a woman that you know who is pregnant, if your child has not really experienced this with you. Look at the calendar to see how long Mary had to wait for Christmas Day. You might make a 9-day calendar, representing the 9 months and use it as a mini-advent calendar, especially if your child is interested in Mary. Each day you could do something that Mary might have done to get ready for her new baby: make diapers, find baby toys, a blanket for the baby, etc. Big Idea: The birth of Jesus was for the whole world! Look at a globe or map and figure out how far it is from Babylon to Bethlehem. Then figure out how long it might take them to make this journey if they were riding camels. You might go to the zoo and look at the camels. Talk about how you would ride one and how they would carry their gifts on the camels. If you don’t go to the zoo, then search the internet together to find great pictures and information about camels? 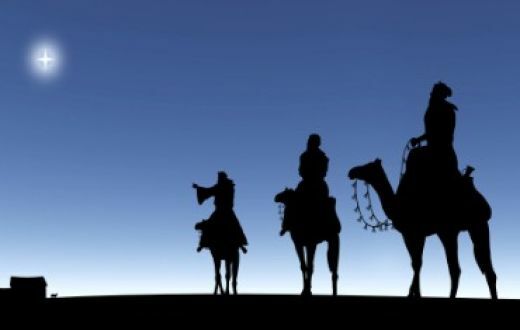 Talk about the star that the wise men followed. Go look at the stars! Are any of them moving? What if you saw one that was moving! What would you do? Why did these men follow the star so far? What did they believe? —You might make a series of stars, graduating the size of the stars from small to large, one for each day until Christmas. Then you could hang or stick them on the ceiling, starting from the farthest corner of your house, but with the largest one above your nativity scene on the night before Christmas, to create your own journey of the magi. Of course, you can gather golden coins (get the $1 coins from the bank), perfume, and spices and make little presents out of them, like the wise men did. With older kids, you can talk about whether the men were kings or not, you can talk about astrology, and you can acknowledge that they probably showed up much later than Christmas Day (Mary and Joseph are in a house, and King Herod has all babies under the age of 2 put to death! ), but that’s not necessary for younger kids. Be sure and ask the question, “Why did God want these people from a foreign country to know about Baby Jesus?” That will give you the opportunity to go back to John 3:16 – For God So Loved the World! Both of these stories contain much more that is important and interesting for adults, but don’t be tempted to overuse them with children. You can use the age-appropriate ideas and help them learn some of the most important truths ever revealed. Star Carol (by Hutson and Burt). It’s a modern carol, very simple, but beautiful. Simon and Garfunkel did a nice version, but one of the most elegantly simple renditions is sung by Anna Maria Alberghetti. Here is a link to Youtube if you would like to listen to it. http://www.youtube.com/watch?v=CPeG0fMqPvE . Mary, Did You Know? is another good, modern carol. There are lots of good versions, so search ITunes or Youtube and pick the artist you like. No Gift Compares is a beautiful carol written by my friend Gary Bruce. You can hear his performance of it at Oklahoma Christian a few days ago on YouTube http://www.youtube.com/watch?v=rMBnoRVgzY4 . One of the early recordings on YouTube actually has the words to it. I can’t wait to hear how it goes with your kids! Next: For the Third Advent Week, we will focus on the Journey of Mary and Joseph to Bethlehem.